Before I get into today’s post, I want to reflect on remembering September 11, 2001. 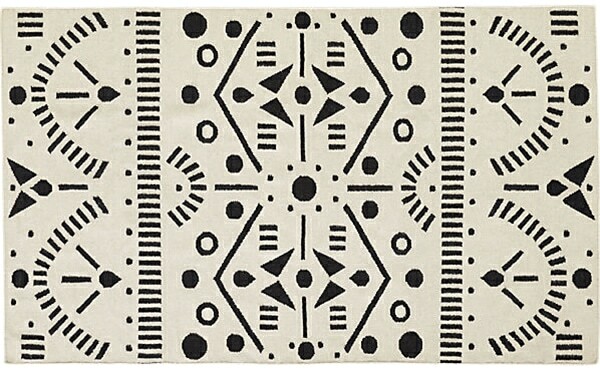 I might be talking mostly about pretty decor subjects on this blog but this doesn’t mean I don’t think about serious things. I have mentioned before that this little blog is a way for me to get my mind off of being to sad or being too serious. It’s an escape but I still feel like I need to remind myself and everyone else that there are things to remember and think about that are more important than decorating. With me traveling a lot in airplanes to Europe September 11th is pretty much always on my mind and a reason for why I have become so scared of planes. And with all the things happening in the world right now I’m constantly scared which again is why this blog helps me. So lets get to some unserious stuff before I start to cry: yesterday I was catching up on some long overdue blog reading and was chuckling while reading my friend Kimberly’s blog post about their man cave (HERE). I thought it was funny that it was risky to leave her other half home alone with the power tools because he might do something drastic. I never have that risk. He wouldn’t even consider picking up the power tools or even possibly the cleaning tools I left behind. He knows at least what a swiffer is though. When I returned from Germany I felt like I was going to have a complete meltdown and he thought the house was clean. I could go into details here but lets just leave it at cat diarrhea on the walls and floors and him telling me he didn’t know how to clean it and was pretty much waiting for me to do it. It sent me over the edge. Men! Or is only mine like this? Oh wow was I trailing off here. I have been seriously thinking about doing something new to our basement too that has been neglected for quite sometime. It’s a difficult space to work with since it houses so so many things. And now I’d like to add a bed (as in pull out couch) to the room. There are so many things I’d like to get new. And while I was dreaming of different layouts, I came up with this little moodboard which houses my favorite sleeper sofa. 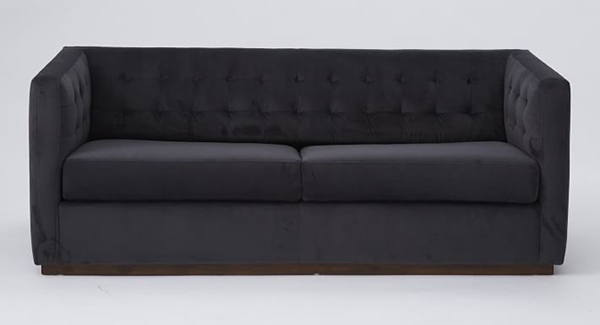 It’s my dream sleeper sofa but I don’t even know if we could get it down there and around the corners and doorways of our small basement entrance. I’d love my entire living room to look like this actually but I don’t want someone sleeping in my living room. And I have been shopping for clothing like this as well lately. It all would fit perfectly into this room. 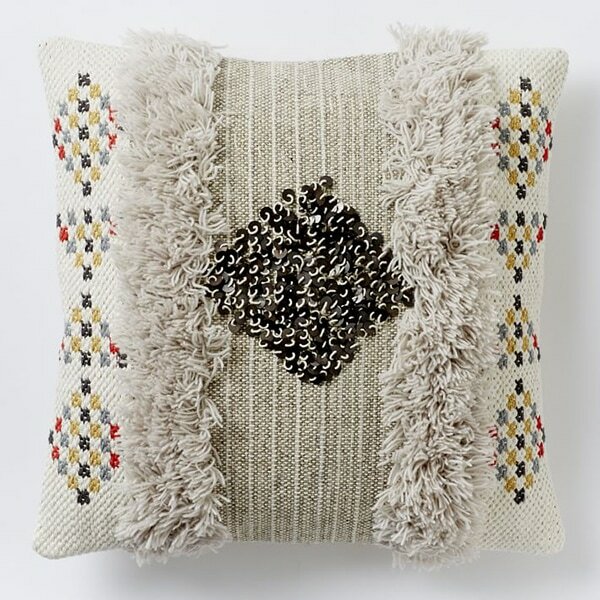 The above throw pillow has been in my inbox 4 times already. I love it so much but am not sure where to put it yet. If I wait too much longer it will probably be gone. 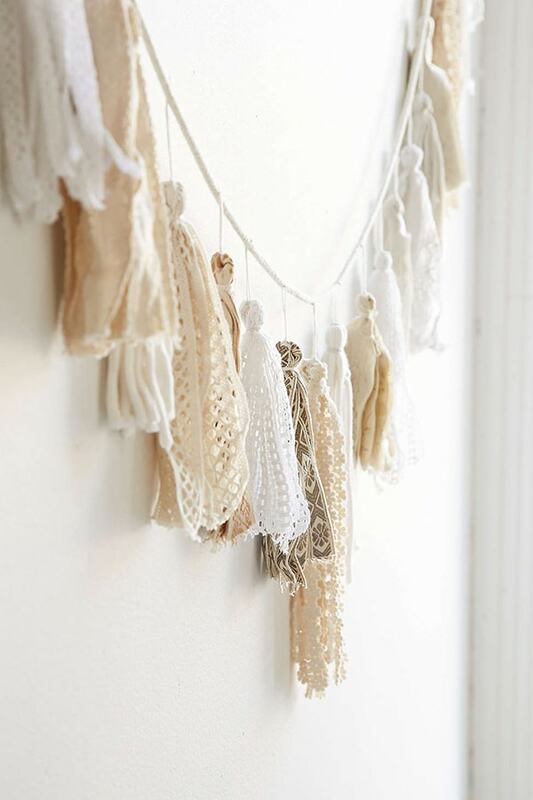 And I’m totally obsessed with the above tassel garland. I know you could easily DIY that one as well but there are some of us who just don’t feel like it, am I right? 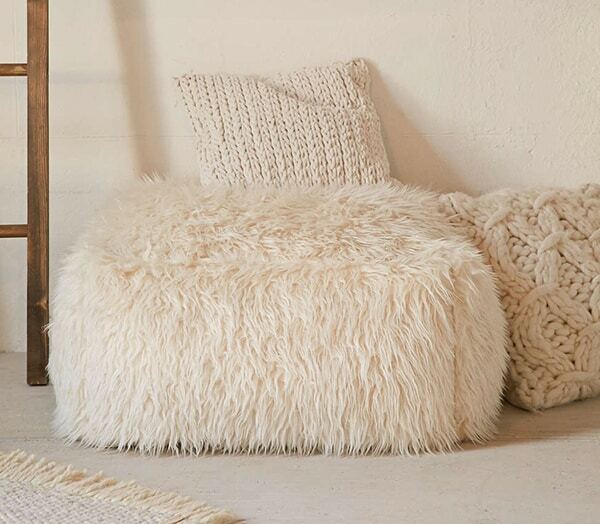 Don’t you agree that is a dream sleeper sofa? My wheels are turning on how I could get the higher sides down into the basement. 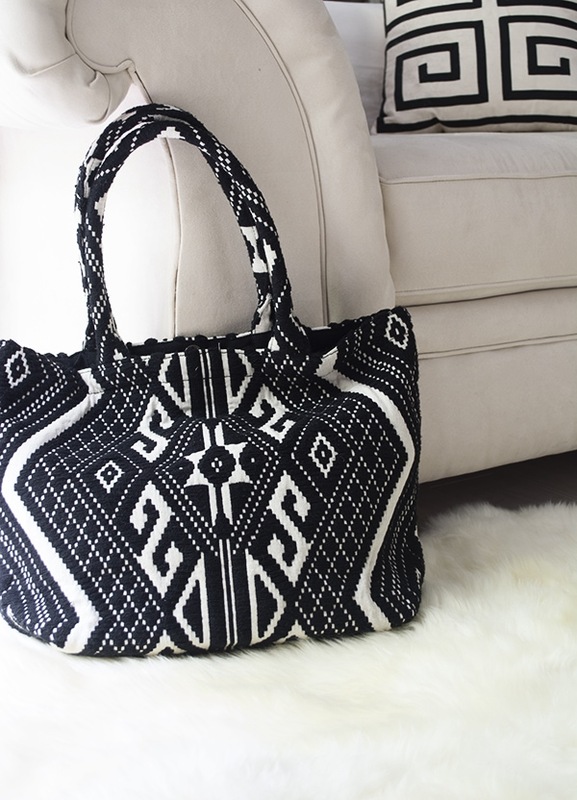 Oh and one more thing, I just bought this boho bag (click HERE) which is also 40% of right now. Isn’t it lovely? OK i am making that garland. i LOVE it! no idea where to put it but love it! I know, I want to make it too and need to find room! It would be perfect for Sweet Clover too. I think my taste gets influenced a lot by what I wear because my wardrobe looks very similar to this room lately. Wow, I cannot even believe that’s a sleeper sofa. Prettiest one I’ve ever seen! BTW you are not the only one with that kind of husband. Now my ex. I need to do mood board, that will keep me focused. Thanks for your post. We had the same problem with a sleeper sofa to go into our basement. No matter what size we were looking at the pitch of the stairway and the drastic turn made anything impossible. BUT, there are people out there who cut these babies apart so that you can get them into your house. I know, I know….it sounds terrible to buy a beautiful sofa and then agree to let someone cut it up. The person who did our’s did a magnificent job. I could never tell where he cut it up, and it has never affected the function of the sleeper. That sofa is sure one to dream about! Love it…. Feeling you on the cat mess. I got home from work the other night at 8:00 (I’m a hairstylist and I work late.) and I asked my partner if he had eaten yet. “No, there was anything to eat!” Me: Why didn’t you cook the turkey tenderloin sitting in the fridge? Him: “You didn’t leave me any instructions!” Me: To myself….you couldn’t READ the directions on the PACKAGE!!! Ooh I love the bag! 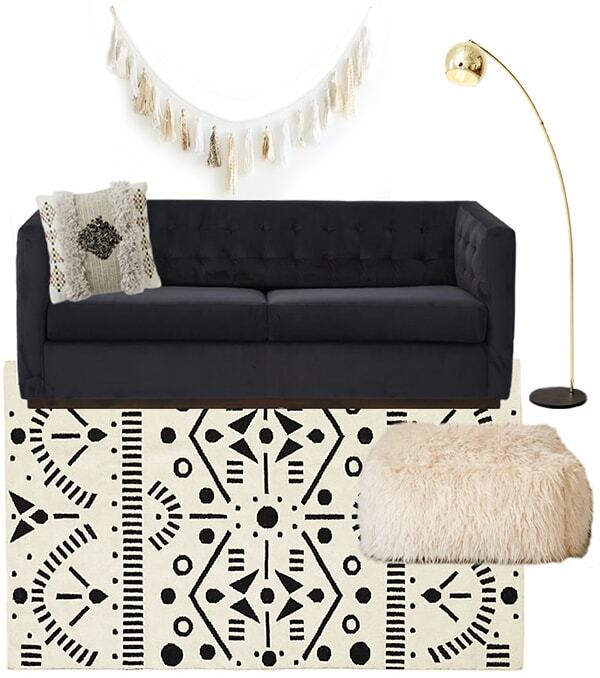 The space has such a fun dose of boho! Thanks, I’m so loving boho right now. ooh, lots of fun stuff! That pillow is amazing! And I’d love a sleeper sofa in my basement to replace the old futon that’s down there….someday! I feel ya girl! Nick is wonderful in so many ways, but he cannot clean. He just doesn’t pay attention to detail enough to clean. It’s a struggle! That sleeper sofa is gorgeous. I love the velvet! 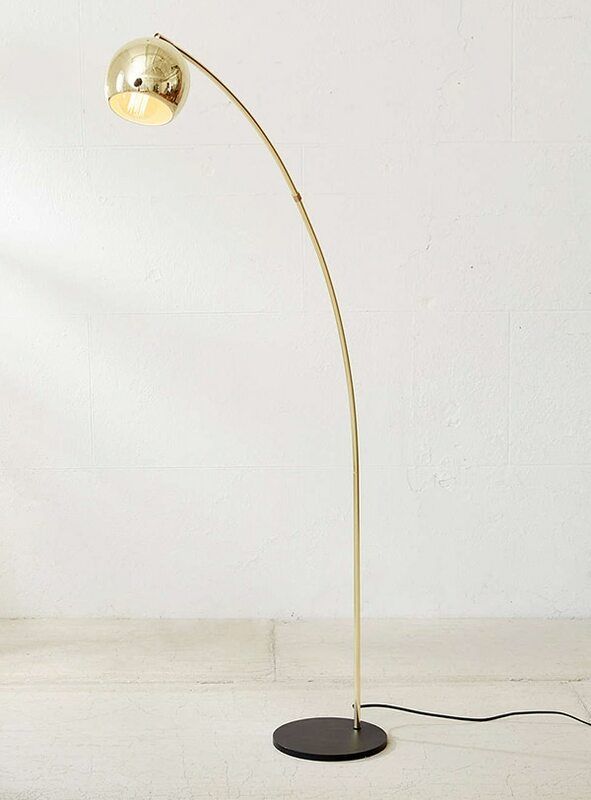 That lamp is pretty killer too!